Penn State highlighted the art of science and the science of art at a booth during the Central Pennsylvania Festival of the Arts. Alex Klippel demonstrates how his lab enables one take a virtual 360-degree field trip to Brazil, Belize, Iceland, and historic University Park campus with virtual reality headsets. Yanan Xin was featured in an EMS Summer Dispatch. Welcome to visiting Ph.D. student, Ekaterina Chuprikova, who is joining us from the Technische Universität München. Her dissertation is focused on “validation of global land cover data, predictive analysis and spatial-temporal uncertainty estimation and visualisation.” Over the next couple of months, she will be exchanging ideas with faculty and students in GeoVISTA and the department about these and related topics. Her desk is in 206A Walker Building. By Wallgrün, J. O., Huang, J., Zhao, J., Ebert, C., Roddy, P., Awe, Jaime, J.,. . . Klippel, A. In P. Fogliaroni, A. Ballatore, & E. Clementini (Eds. ), Proceedings of Workshops and Posters at 13th International Conference on Spatial Information Theory (COSIT 2017). Springer: Berlin. By Oprean, D., Wallgrün, J. O., Duarte, J., Pereira, D., Zhao, J., & Klippel, A. (2017). In P. Fogliaroni, A. Ballatore, & E. Clementini (Eds. ), Proceedings of Workshops and Posters at 13th International Conference on Spatial Information Theory (COSIT 2017). Springer: Berlin. Hmm … what’s missing here? 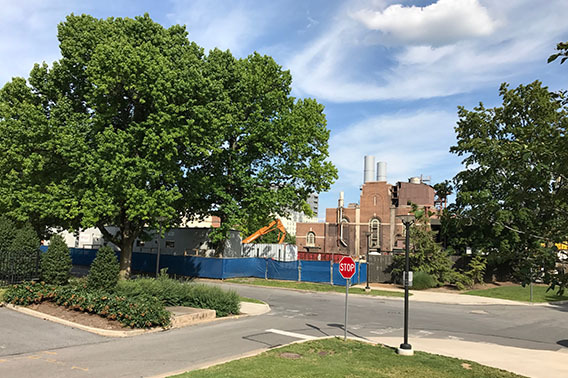 This is the view from the eastern side of Walker Building looking toward the West Campus Steam Plant. 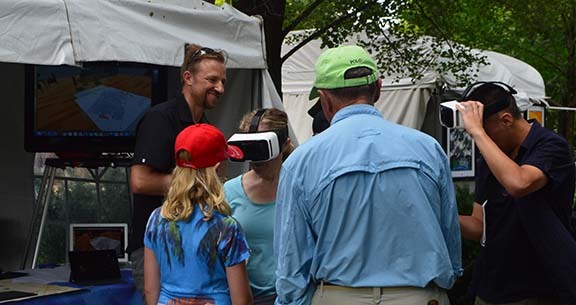 ChoroPhronesis will be featured at the Penn State Arts Festival Booth on Friday, July 14, 3:00 to 5:00 p.m. They will be sharing several augmented virtual reality experiences. We love hearing from our talented students in the Penn State online geospatial program, especially about what they have learned from our classes and how they plan to apply their certificate/degree. Jim Daly, from Huntington, New York, entered our program in Fall 2013 and is on track to complete his MGIS degree in 2018. For his capstone project, he plans to pursue developing an online subdivision and zoning web map application for local municipalities and residents. The purpose of the application would be to identify property subject to certain state and municipal subdivision and zoning laws based on proximity to environmental features and governmental jurisdictions. In October 2014, the CFS requested the HLPE to conduct a study on Sustainable Forestry for Food Security and Nutrition. The HLPE is now launching the report in FAO. Q&A session will follow the presentation (link to agenda below). Forests and trees contribute to food security and nutrition (FSN) in multiple ways. They provide wood, energy, foods and other products, generate income and employment, delivering ecosystem services vital for FSN, including water and carbon cycle regulation and protection of biodiversity. Increasing and competing demands on land, forests and trees create new challenges and opportunities and impact FSN. This report calls for a renewed understanding of sustainable forestry in order to fully integrate the different functions of forests and trees, from farm and landscape to global levels, as well as at different timescales, for enhanced FSN and sustainable development. This requires inclusive and integrative governance mechanisms at different scales that enable the full and effective participation of concerned stakeholders, particularly of forest-dependent indigenous peoples and local communities.